Thanks, Mail Carrier | Restaurant.com Secret Deal Promotion Coming Up This Week! Restaurant.com Secret Deal Promotion Coming Up This Week! When it comes to taking advantage of a deal, I'm always on the lookout for a good bargain... and that is exactly what is coming up this week from Restaurant.com! 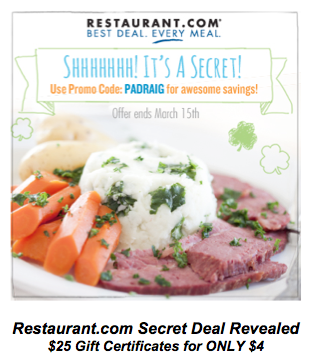 From March 13th - 15th, enter the promo code PADRAIG to purchase $25 Restaurant.com gift cards for only $4! If you've never visited Restaurant.com, you'll want to head to their website to see what local restaurants and small businesses in your area are included so that you can get the best deal on your next meal. The site is designed to help diners find and visit local restaurants, get a great value, and, in turn, strengthen the local economy. What more could you ask for? Your favorite restaurant might be waiting for you to discover it right in your own neighborhood, so let Restaurant.com not only introduce you, but save you a great deal of money at the same time. Ooo I love it when restaurants.com offers this type of discount! There are a few restaurants in my area that qualify and with this deal, going out to eat isn't such a huge expense! Thanks for sharing! Sometimes places have strict requirements on how you can use these. Gosh, I have to miss such a good deal...Hope I am on time next time. I have used restaurant.com before and they are accepted without questions.